Yesterday was a great day, as we were able to purchase a really sharp group of 1956 Topps baseball cards, from a seller out in Minnesota. He contacted us two weeks ago, wanting to know the value of his cards, and was also curious about the selling process. He wasn't 100% sure if he was going to sell, but he was just putting some “feelers” out there. The cards have been in his family for a few generations, as they were passed down from his father's uncle, to his father, and finally to him. These cards are mint, as if they were just pulled from a pack! His great uncle and father obviously took superb care of these cards, to have lasted almost sixty years in this condition. The only downside is that a few of the cards have centering issues or were mis-cut – something that happened during production, and is out of any collector’s control. Oh well. The cards were still sharp, and we were very interested. 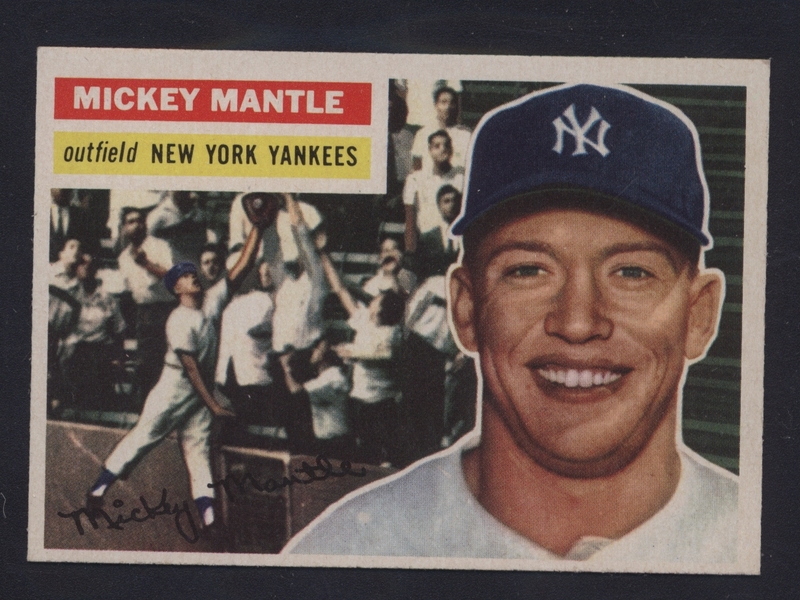 I absolutely love the 1956 Topps set. I think it's one of the best looking sets ever produced. The design and imagery is second to none, with a full color action shot placed next to each players portrait. Additionally, the set is absolutely loaded with Hall of Famers, making it extremely valuable in any grade! After a few calls back and forth, the seller finally decided it was time to part ways, and he shipped us his collection. Knowing that this collection will have some decent value, we had him ship it on our FedEx account, that way it was insured, and also so he didn’t have to incur any costs. Once we got the cards in, we gave him a free appraisal, and had an offer ready for him just hours later. He took the rest of the day to think about it, and called us first thing the following day, and happily accepted the offer. The two other cards that really stood out, in terms of condition and value, were the Ted Williams and the Sandy Koufax. Those two cards are stunning, and appear to be in Near Mint or better condition. Other highlights from the collection include the Hank Aaron and Roberto Clemente, both sharp, but having the misfortune of being mis-cut. This partial set also includes high-grade examples of Ernie Banks, Eddie Mathews, and Harmon Killebrew! We’re looking to buy sets and collections like this all the time, so please give us a call if you are looking to sell your vintage collection! Contact one of our card specialists today to book an appointment!